Managing inventory as an ecommerce retailer is becoming increasingly challenging with the evolution of business. The larger is your business, the more sophisticated ecommerce solution it needs to accomplish multiple business operations. With businesses going multichannel, retailers aim at delivering quality goods at the right time, in the right amount and in the right location. Undoubtedly, their orders need to be routed to the correct warehouse and then fulfilled in an efficient manner. To do so, orders go through multiple steps managed by different teams at various stations throughout warehouses which increase the intricacies. And if you are using Magento for your ecommerce needs, you definitely will be enjoying the looks, unparalleled flexibility to manage the content and the splendid functionalities it offers, but to everyone’s surprise will miss out on delivering products from multiple locations. Why? Reason is you will not find any appropriate warehouse management system in Magento by default. But with i95Dev Warehouse Management solution, Magento merchants no longer are restraint of managing inventory with a single warehouse. i95Dev’s Warehouse Management solution fills the gap and provides Magento merchants with the functionality that can match the present day business needs to manage multiple warehouses simultaneously. The solution introduces Magento warehouses as a new entity which allows you to arrange shipments of orders containing products that can originate from different locations. The solution gives retailers higher competitiveness; it offers the functionality to automatically split order items into several compositions owned by particular warehouses and, therefore, saves much time and eliminates human mistakes during the shipping. 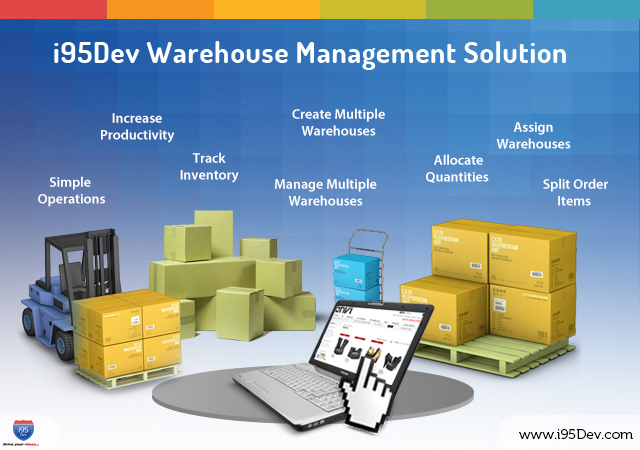 i95Dev Warehouse Management solution allows you to create warehouses in Magento and sync to Dynamics GP and vice versa. You can now create and manage warehouse from any system you desire. You can assign warehouses to stores using Warehouse Management solution. And most importantly, you can prioritize your warehouses against a store for efficient item management. Assigning warehouses one at a time for every individual product has always been a very time consuming process. But you no longer have to bear that pain, as i95Dev Warehouse Management solution is quick, responsive and accurate enough to assign multiple warehouses to a product at one go.